Gold traded lower Wednesday as the U.S. dollar gave up the gains it saw in the immediate wake of the resignation of key Trump ally Gary Cohn, purportedly over the gully in their views on trade and tariffs. April gold GCJ8, -0.55% fell $3.20, or 0.2%, to $1,332 an ounce. It settled Tuesday at $1,335.20 an ounce—the highest finish since Feb. 16. The contract has been volatile in recent days considering that gold prices had settled at their lowest levels of the year just last Thursday. Part of gold’s about-face may hinge on the dollar’s moves. The ICE U.S. Dollar Index DXY, +0.26% steadied Wednesday. It had strengthened overnight after declining Tuesday. Commodities priced in dollars often trade inversely with the dollar, as moves in the U.S. unit can influence the attractiveness of those commodities to holders of other currencies. The greenback tumbled to 16-month lows against the Japanese yen USDJPY, -0.11% late last week when the first of this trade-related market churning underpinned a flight to the perceived safety for assets such as precious metals. and the yen. 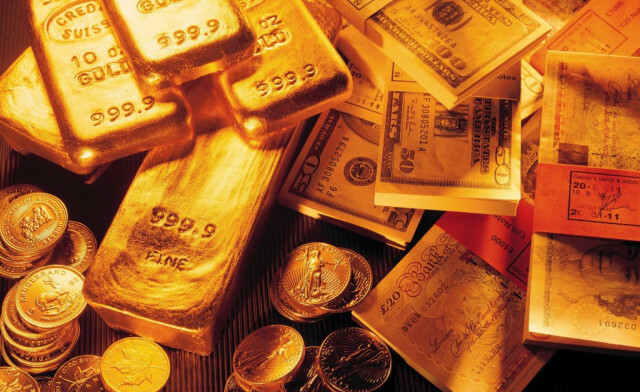 Prices for gold had climbed overnight, when the dollar tumbled on news of Cohn’s resignation. Bloomberg News late Tuesday reported that hours before Cohn’s departure, Trump had asked the adviser to publicly endorse a plan to implement tariffs. That adds credence to expectations that the import duties—a 25% tariff on steel and 10% on aluminum—will be levied in coming days. U.S. economic data on Wednesday were mixed. The ADP employment report revealedthat employers added a more-than-expected 235,000 jobs in February, while other data showed that the trade deficit climbed 5% in January and hit a nearly 10-year high and U.S. productivity in the fourth quarter was revised to show no gain instead of a 0.1% decline. The Beige Book release is expected at 2 p.m. Eastern. There are two Federal Reserve officials on the speaker list Wednesday. New York Fed President William Dudley is due to talk about the impact of the hurricanes to the Puerto Rico Chamber of Commerce. Atlanta Fed President Raphael Bostic is scheduled for a fireside chat on economic outlook in Fort Lauderdale, Fla.
May silver SIK8, -1.60% fell 20.4 cents, or 1.2%, to $16.58 an ounce. Among exchange-traded funds, the silver-focused exchange-traded iShares Silver Trust SLV, -1.34% fell 1% and the SPDR Gold Shares GLD, -0.56% edged down by 0.3%. May copper HGK8, -0.71% traded at $3.135 a pound, down 0.8%. April platinum PLJ8, -1.51% fell 1.2% to $959 an ounce and June palladium PAM8, -1.47% fell 1.4% to $964.65 an ounce.